Caught in mid-trot: the Paso Robles Capybara! It was about a month ago when two workers at a wastewater treatment plant in Paso Robles, California, spotted an unusual looking animal hanging around. It wasn’t bothering anyone, but man, was it funny to look at! It was like some kind of giant water rat. As it turns out, after consulting with the Department of Fish and Game and showing them the pictured taken by Nick Kamp and Craig Rambo, that the giant creature is a South American species known as the capybara. 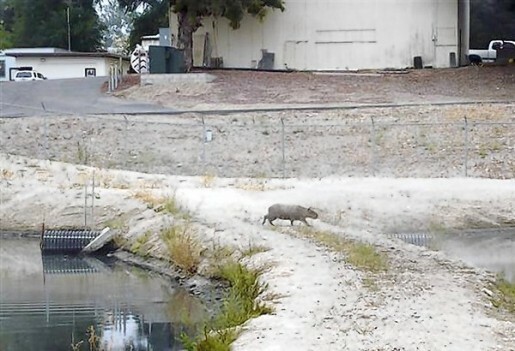 That’s right, a capybara was found in Paso Robles, California, hanging around the water plant. Even weirder, Fish and Game says they’re going to leave the fully-grown capybara (which is over 100 pounds) right where he is to live a rich and full life. Normally, invasive foreign species are pretty damaging to the environment and the capybara is illegal to have in California, but apparently this particular capybara isn’t really causing any problems for locals, so since nobody knows how to cook it, there’s no need to pester it with traps and nets.